Specifications: Micron Rating: 0.5 Microns Flow Rate: 0.5GPM 1:89 LPM - 2.0 GPM/7.56 LPM Dimensions: 3.4in X 17.75in Capacity: 12 months or 12000 gallons Max Temp: for cold water use only: 100 degrees F (38 degrees C) Max Pressure: 125 psi "This water filter model does not fit on multiple filter systems as shown here on the left with a red X mark. The reason is the metal backing does not allow the larger diameter of the top of the filter to sit in properly. This particular model will only fit on systems that are single filter based such as the filter housing on the right with a green checkmark or multiple filter systems that do not have a metal bracket backing which would interfere with the larger diameter of this model. Please make sure you have the right filter for the right system. Thank you." Products Desciption Performance: NSF/ANSI 42 class - Lead, Chlorine, Taste, Odor, Sediment, Particulate iron (i.e rust particles), Particulate lead and particulate class 1. NSF/ANSI 53 class - Lead, Mercury, VOC, MTBE, Cyst, Asbestos, and Turbidity. CARBON BLOCK WITH PHOSPHATE ( Scale Inhibitors ). KDF to inhibit the growth of bacteria. 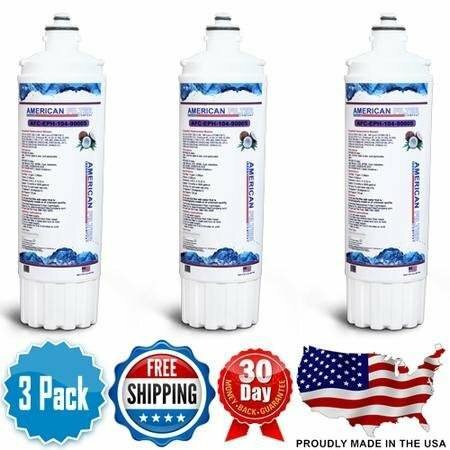 Details: Hoshizaki 4HC-H compatible replacement water filter by American Filter Company. Compatible with: HOSHIZAKI HCHC-HHFHF-HPRO 3500HCH-CTOHFHBW 4400BW7 TOS. VERY IMPORTANT! *Please CONFIRM FITMENT - Filter dimensions Dimensions: 3.4in. X 12.25in. Fits Filter Heads: Filter cartridge fits the Hoshizaki head and has the same specifications as the Hoshizaki Cartridge. *Disclaimer: Do not use this filter with water that is Hot. Hoshizaki is a registered trademark of Hoshizaki Electric Co Ltd. Corporation Japan. KDF® is a registered trademark of KDF Fluid Treatment, Inc.
NSF/ANSI 42 class - Lead, Chlorine, Taste, Odor, Sediment, Particulate iron (i.e rust particles), Particulate lead and particulate class 1. NSF/ANSI 53 class - Lead, Mercury, VOC, MTBE, Cyst, Asbestos, and Turbidity. CARBON BLOCK WITH PHOSPHATE ( Scale Inhibitors ). KDF to inhibit the growth of bacteria. If you have any questions about this product by American Filter Company, contact us by completing and submitting the form below. If you are looking for a specif part number, please include it with your message.